Sip Marine uses the most sophisticated CFD tools, Fine™/ Marine. This software enables us to accurately predict resistance and performance of the vessel. All details of pressures and speeds, turbulences, etc. are available on and around the vessel’s model. 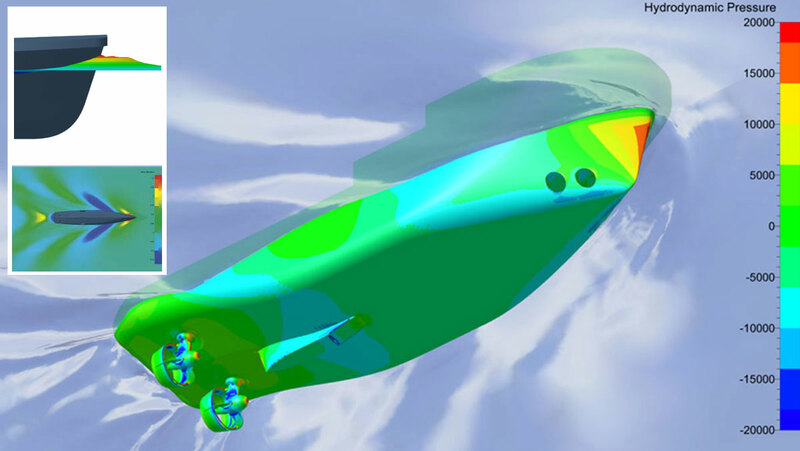 Fine™/ Marine CFD opens the possibility to model a near-realistic model in early stages, and to simulate all behavior. Therefore, very rapidly choices for ship-and-propeller designs can be made. The purpose of CFD is excellent to support designers in the choices for the shape of the hull and its appendages. By using the CFD analyses, Sip Marine can inform in an early stage about the hydro dynamically properties of the vessel. It is also possible to advise about areas where improvements are possible, and thus to optimize the design together with the customer. Sip Marine also uses CFD for analysing new ideas and concepts, for own applications and for our customers. New development of propellers, nozzles, propeller shafts, struts, thrusters, rudders but also the complete shape of the hull can be analysed by our company. The effects will be visualised so there is a clear vision about effectivity and viability. With this it is possible for ourselves but also for our customer to introduce innovative products into the market.